The number one condiment has got to be Tomato Ketchup. 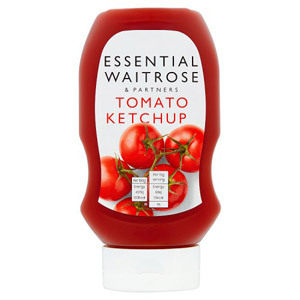 An essential to your store cupboard, Tomato Ketchup is a condiment loved by kids and adults alike. Waitrose has provided a handy squeezy bottle which makes it much easier to use than the traditional glass bottle and means you can enjoy it to the last drop. This flavoursome condiment is incredibly versatile and can be paired with potato chips, meat, fried eggs or whatever you like!